I realised I hadn't bought myself a finished copy. Now I have one! I do love this cover! I have wanted this book for AGES, ever since it was originally released as a Borders' exclusive in America. I found out the other day that it was released again, and was able to order it on Amazon. I so wish it was available when I was writing my essay on the Twilight series when I was taking my Young Adult Fictions class. It would have been gold dust! Reading it now, and I'm really enjoying it! Makes me want to pick up Twilight again. I may or may not review this book. It's neither YA or fantasy, so fits neither blog. It's adult romance, and I absolutely love Freya North as her novels are always so funny! I've yet to read her last release, Secrets, but I couldn't not buy Chances. Looking forward to it. So I'm a happy girl this week, yet again. Do review Freya North. Some of us love YA and adult too. I used to read a lot of Freya North. I think she is fabulous. I adore that cover for Entangled...I so need to get that book! Thank you! :) I love that cover too, it's just gorgeous! Eden - I will do! I will review it once I'm done reading it. I'm enjoying it so far, it's really good! Only know of Entwined but i hope you like all of them! I hadn't heard of Freya North before but her books do look like something I'd enjoy. I like chick lit/romance. Entangled sounds fascinating. I love the cover. I can't wait to read Entangled! I really need to order it already. Enjoy! Nice mix! 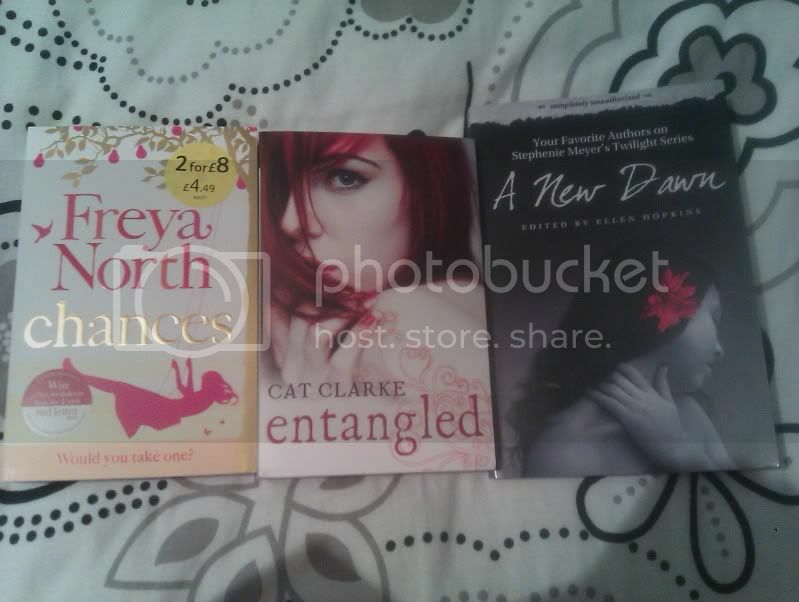 I've heard the most about ENTANGLED but I'm curious to see how you enjoy all three. Happy reading! Gabby - Thanks for following!